‘Italian Cena’ Make It Italian on Fridays! The Square at Novotel Bangkok Silom extends Italian buffet with a COME 3 PAY 2 offer. The Square at Novotel Bangkok Silom extends ‘Italian Cena’, on every Friday until September. Priced at only THB 439++ per person, the buffet meal is especially appetising for groups, who can take advantage of a superbo ‘Come 3 Pay 2’ offer. The price includes one glass of limoncello liqueur per person. Italian Station serving delicacies such as Roasted Pork Belly and Deep-Fried Calamari. The venue’s own pizza oven will be serving up many varieties, while the buffet’s Pasta Station will include a large selection of noodles and sauces. More Italian favourites enhance the buffet’s Cheese Station and, for dessert, Tiramisu will tempt among many other sweets. 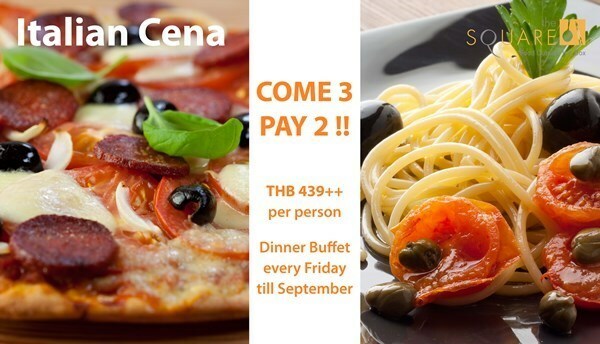 Italian Cena buffet with COME 3 PAY 2 offer is extended until end of September 2014! In addition to Italian specialities, guest also can enjoy the buffet’s high-grade Japanese sushi, numerous Indian favourites, many Asian stir-fry dishes as well as fine meats including rib eye and lamb. Live grill stations likewise feature succulent meats and fresh delicacies.